Day 1 of The Boomsday Project is now complete! We've seen an enormous variety of decks on the first day, ranging from combo decks with Mecha'Thun to mech decks with Dr. Boom, Mad Genius. Let's take a first look at what everyone's playing and what is winning. 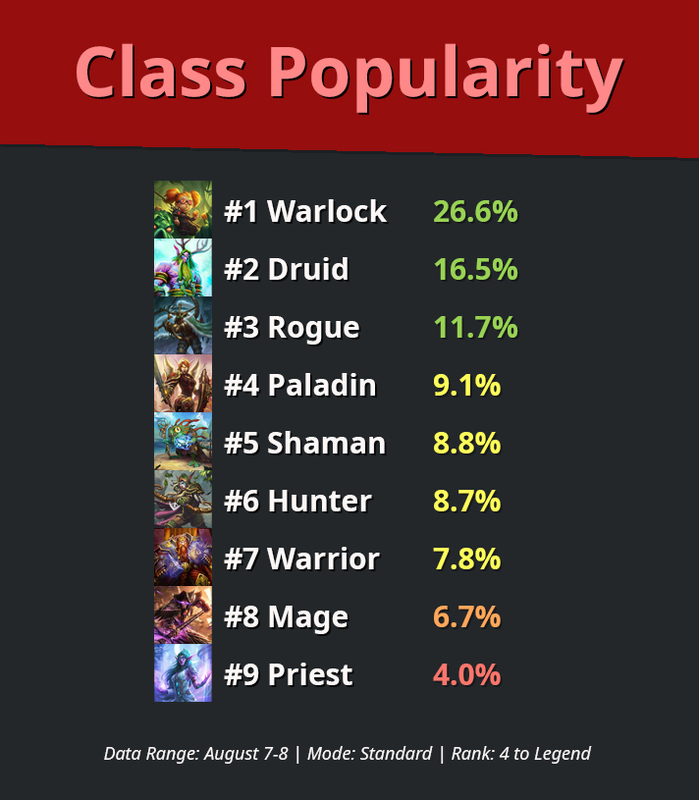 Here's a look at the Class Power Rankings after Day 1 of Boomsday. Warlocks are off to the early lead with a large amount of old and new Zoo Warlock decks. Druids also performing well with a variety of Token Druid and the very fun Mill Druid. Priest is carrying up the rear with players struggling to figure out a good deck with the new cards. We saw many streamers playing the intricate Combo Priest on Day 1, but everyone has been struggling with pulling out wins with it. 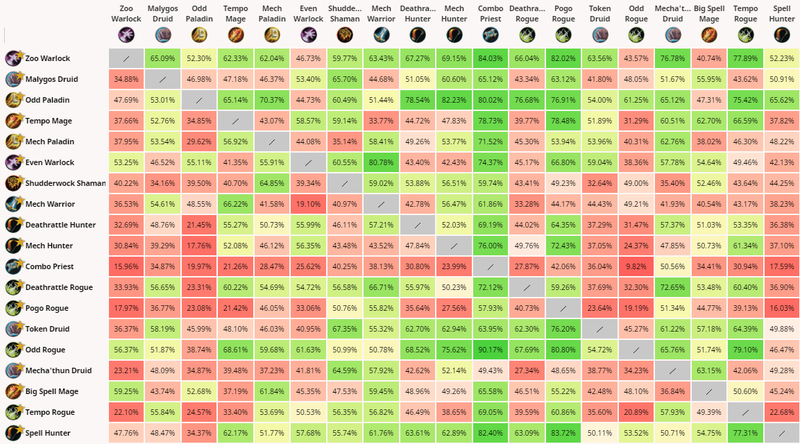 Surprisingly, we're already starting to see players gravitating towards the classes that are performing the best with winrates in this first day. Here's the class rankings based on popularity right now. Warlock right now is an overwhelming favorite with players adding the new cards to previously good archetypes: Zoo Warlock and Even Warlock. 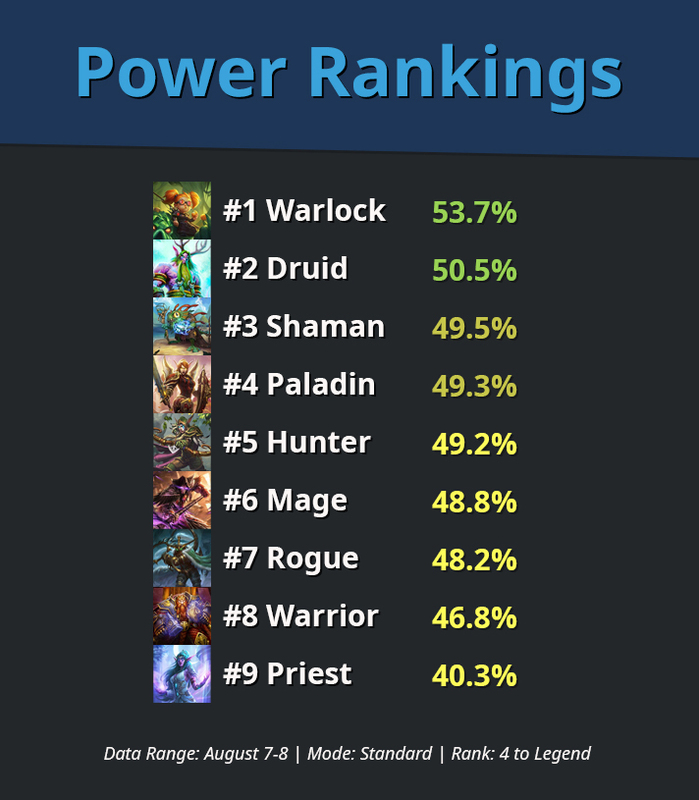 Warlock also was one of the classes, along with Druid in the second spot, that players were experimenting with the highly discussed Mecha'Thun. Druid is also seeing a large variety of decks being played with old and new Ent versions of Token Druid, Mill Druid, Malygos Druid, and Mecha'Thun. Rogue isn't too far behind with with players trying out a large variety of different decks. We seen a lot of Deathrattle Rogue, Odd Rogue, and even the new Pogo Rogue. Once again Priest looks to be the big loser so far in Day 1 in terms of player intrigue. Mill Druid (60.3%): This deck had some traction in the beginning of The Witchwood, but eventually settled in the bucket of meme decks. What a difference new cards like Biology Project and Dreampetal Florist can make! The huge and consistent discount from Dreampetal Florist on Azalina Soulthief and King Togwaggle has made the fatigue win condition very viable. We'll see if it holds up as faster decks start to get more popular. Token Druid (59.6%): This deck was very good in The Witchwood, and with the addition of Floop's Glorious Goop giving more reloading firepower and Giggling Inventor providing another strong way to fill the board, this deck doesn't appear to be moving anywhere outside of the top for a while. Even Shaman (58.7%): Here is another deck that was one of the top decks in The Witchwood that has only a couple new additions. This deck has always been about card that have high individual value and both Thunderhead and Arcane Dynamo fit that classification. Thunderhead can allow you to get out a Sea Giant the following turn for a huge swing or even help you with fighting off decks that go wider on the board. Arcane Dynamo can find you an effective card pretty consistently to finish games or catch you up if you're behind. Spell Hunter (57.9%): This deck continues to have the most consistent success for Hunter even with Deathrattle Hunter and Recruit Hunter being the topic of discussion a lot of times. The only addition we've seen so far is Secret Plan which gives even more consistency and ammo for the big Lesser Emerald Spellstone play. Zoo Warlock (57.2%): This deck or a variant of this deck has easily been the most popular in the first day of the expansion. The synergy that Soul Infusion has with Saronite Chain Gang and the new Doubling Imp make it even stronger when fighting for board control in the early game. The Soularium makes it even harder now to out last this deck. Day 1 of The Boomsday Project has brought us a little bit of new mixed with what we saw success with in The Witchwood. Try some of these decks out and let us know on Twitter how you fare with them!